$24,000 PRICE REDUCTION SELLER IS MOTIVATED AND SAYS BRING OFFERS! POSSIBLE OWNER FINANCING GREAT LIVEABOARD WITH LOTS OF ROOM FOR GUESTS This is the "houseboat" style, with the wheelhouse forward and galley, salon and aft deck all on the main deck level. This style gives asurprising amount of space, both inside and out, including a large walk-in engine room. BRAT has been updated significantly in recent years and offers lots of style for not a lot of money! This boat will make an ideal liveaboard or a great island cruiser. 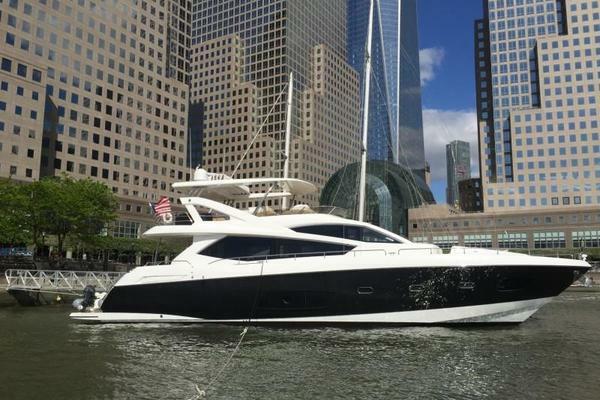 United Yacht Sales New Jersey would love to guide you through a personal showing of this 75' Broward Flybridge Motor Yacht 1976. This yacht for sale is located in Key West, Florida and priced at $275,000. For a showing please contact us by filling out the form on this page and we will get back to you shortly! Forward on the main deck level is the enclosed wheelhouse which includes a large bench seat that doubles as a berth, with storage below. There are doors that open to the side decks, both port and starboard, a ladder to the flybridge, a curved companionway step forward to starboard that leads to the crews quarters and engine room and a door to starboard that leads aft to the galley, main salon and aft deck areas. Aft of the wheelhouse, to port, is the large galley which was completely refitted in 2006 with all new appliances, cabinets and granite counter tops. The galley is followed aft by the spacious main salon with leather sofa, two occasional chairs, glass cocktail table and two end tables. The salon bulkheads are teak, there are cellular blinds on the windows and there is an entertainment center with wide screen TV and storage lockers at the forward bulkhead, followed aft by a dining table with chairs and spiral companionway step to the master and guest staterooms, aft to starboard. Aft of the main salon is the spacious aft deck area with full width transom seat, 4 wicker chairs, tables and wet bar. Below decks, the master and guest staterooms are at the rear of the boat, accessed by stairs from the main salon. Aft is the full beam master stateroom with private head and his and hers hanging lockers with abundant drawers and lockers for storage. Forward of the master are two identical guest staterooms with twin berths, port and starboard. The starboard stateroom has an ensuite head with shower and the day head, accessible from the companionway to port, also has a stall shower. The decor in the master and guest staterooms and heads was updated in 2006. Below decks, forward, are the crews' quarters, utility area and entry to the engine room. This area is accessed by a spiral companionway, to starboard of the lower helm. The anchor locker is forward, followed by a captain's cabin with twin berths P & S and abundant storage lockers and drawers. Aft of this cabin, to port, is a full head with stall shower, followed aft on the centerline by a utility/crew area with a Manitowoc commercial icemaker, Kenmore chest freezer, full height storage locker and two berths. The entry to the walk-in engine room is at the aft bulkhead of the utility room. The large U-shaped galley is portside on the main deck level, abaft the wheelhouse and forward of the main salon/dining area. The galley was completely updated in 2006 with all new cabinets, granite counter tops and stainless steel faced appliances. The cabinets have the "auto close" feature, with additional sea catches.